"This new double LP version mastered by Kevin Gray and pressed at QRP on translucent vinyl is by far the best sounding TRON you will hear. Like Audio Fidelity's QRP-pressed Bladerunner reissue, TRON is a sonic spectacular. 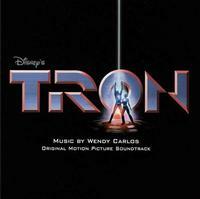 If you are a TRON soundtrack fan, I guaranty you, you will hear further into the mix than ever before. The bottom end on this production is stupendous and Kevin gets it all. Carlos's crystalline high frequency synth ‘stings' attain a clarity and precision that sound as if the recording was produced last week, never mind in 1982. This reissue also re-creates the three-dimensional spaces both real and artificial that I've not heard since I heard the final mix on the dubbing stage." Music = 10/11; Sound = 10/11 — Michael Fremer, sound supervisor for the film "TRON" and editor, AnalogPlanet.com. To read Fremer's review of the reissued double LP, pressed by Quality Record Pressings, click here. "The score deserves another listen in the analogue domain by another generation." — Michael Fremer, sound supervisor for the film "TRON" and editor, AnalogPlanet.com. To read Fremer's full discussion of the "TRON" reissue click here. Fresh on the heels of their success with the "Blade Runner" soundtrack, Audio Fidelity is teaming up again with Quality Record Pressings and mastering engineer Kevin Gray to reissue Wendy Carlos' "TRON" soundtrack as a double 180-gram LP on translucent blue vinyl. How sweet is this?! "TRON" tells the story of hacker/arcade owner Kevin Flynn, who is digitally transformed into a data stream by a villainous software pirate known as Master Control and reconstituted into the internal 3-D graphical world of computers. It's there, in the ultimate blazingly colorful, geometrically intense landscape of cyberspace, that Flynn joins forces with Tron to outmaneuver the Master Control program that holds them captive in the equivalent of a gigantic, infinitely challenging computer game. Disney's video game crossover movie "TRON" was a notable landmark in the synthesis of electronic and traditional orchestral music. Carlos created a brilliant orchestral recording with symphonic backgrounds by the London Philharmonic Orchestra and the UCLA Chorus that was later enhanced and upgraded with an electronic score. The result is an impressive soundscape that successfully and seamlessly fuses organic and electronic music. "TRON" was originally envisioned by the multi-Grammy Award-winning Carlos (who also scored "A Clockwork Orange" and "The Shining") as a synth-based score with string section overdubs. But production delays forced the composer to reverse the original plan and produce a mostly orchestral soundtrack with the London Philharmonic. A distinctive gatefold jacket holds two 180-gram translucent blue vinyl records and includes colorful photos from the popular cult film as well as generous and informative liner notes written by the composer as well as music maven Michael Fremer, the editor of AnalogPlanet.com, who was the sound supervisor on the film. The reissued soundtrack includes two songs by Journey, "Only Solutions" and "1990's Theme."